An artist's image of OGLE-2005-BLG-390Lb, a frozen world that could resemble the "Star Wars" world Hoth. From the icy reaches of Hoth to the tiny inferno of Mustafar, every "Star Wars" fan has a favorite alien world from this iconic science fiction franchise. But what do people who study real planets beyond our solar system think about these fictional worlds? Last week, close to 350 exoplanet scientists gathered in Hawaii for the American Astronomical Society's Extreme Solar Systems III conference. Space.com took the opportunity to ask 20 of these folks about their favorite "Star Wars" worlds. Hoth — the frozen, nearly barren world where the Rebel Alliance makes its secret base — just barely edged out the other "Star Wars" planets as the top favorite, with six scientists calling it their first choice, while two others listed it a close second. "I'm from Iceland, and it appeals to me," said Gudmunder Stefansson, a graduate student in astronomy and astrophysics at Pennsylvania State University, when asked why Hoth was his favorite. Ryan Cloutier, an astronomer and exoplanet researcher at the University of Toronto, gave a similar reason: "I'm Canadian." Scientists have detected frozen, rocky planets around other stars. And, of course, there are some intriguing icy bodies in our own solar system that scientists are hoping to get a better look at. Stephen Kane, an assistant professor in the physics and astronomy department at San Francisco State University, had a lot to say about the George Lucas' single-climate worlds. "It makes no sense in terms of obliquity," he said, referring to the tilt of a planet in relation to its star, and the reason for the seasons on Earth. "Different parts of the planet will be receiving different amounts of radiation, so how can it be all the same?" he asked. Still, he admitted that his favorite "Star Wars" planet was Hoth, due to his "soft spot" for the movie "The Empire Strikes Back." An artist's image of Kepler-16b, a world that orbits two stars, much like the planet Tatooine. Tatooine brought in five votes apiece from the scientists polled. So did the moon of the planet Endor, home of the Ewoks and the site of an epic final battle in "Return of the Jedi." For some, the choice was easy. Bill Welsh, a professor at of San Diego State University, studies circumbinary planets for a living. He said he would be in trouble if he didn't vote for Tatooine, the planet famous for orbiting two stars (the double sunset featured in "A New Hope" is one of the most iconic shots in science fiction movie history). Elisa Quintana, a research scientist for the Kepler Space Telescope (which hunts for exoplanets) at NASA Ames, selected Tatooine for the same reason. "It just seems like a very nice place to live," said Courtney Dressing, a postdoctoral fellow at the California Institute of Technology. Chris Burke, a support scientist for the Kepler mission at the SETI Institute, was torn between Endor's moon and Hoth. He said he likes the idea of being able to visit Santa Cruz, where the Endor scenes were filmed, because the world is a "believable thing." 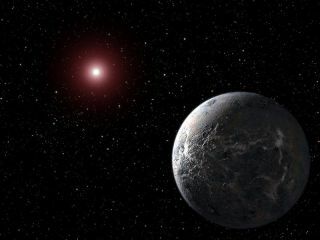 Sean Mills, a graduate student in astronomy and astrophysics at the University of Chicago, selected Endor's satellite because "I just want to see an exomoon [discovered] soon." Dawn Gelino, a scientist at the California Institute of Technology, said that worlds orbiting two stars are rare, so she would have to select Tatooine. "But I wouldn't want to live there," she said. "It's too dry and dusty." "And that's where the Tusken Raiders are!" Kane added. Although Hoth, Tatooine and the moon of Endor appeared to be the Big Three among planetary scientists, a few other worlds made an appearance in the poll (though no one selected the lava-drenched planet of Mustafar, featured in "Star Wars: Episode III – Revenge of the Sith"). Naboo — the lush home of Queen Amidala in the "Star Wars" prequels — received two votes. Jason Steffen, an assistant professor of physics and astronomy at the University of Nevada, Las Vegas, selected Naboo because of its liquid core and enormous sea creatures. "Sea creatures are awesome," he said. Steve Bryson, a support scientist for the Kepler mission at NASA Ames, had a more artistic reason for his choice — in addition to sea monsters, Naboo hosts a number of wealthy cities that feature some incredible architecture. He selected the planet because "I'm a sucker for art deco." Two of the planetary scientists that were polled didn't name a specific "Star Wars" planet. Although they were questioned separately, both said their choice involved Yoda. "Any planet that has Yoda is clearly superior," said Lauren Weiss, a graduate student in astronomy at the University of California at Berkeley. Thomas Beatty, a postdoctoral researcher at Penn State, asked, "Does it have to be from the movies, or can it be the expanded universe?" Corellia, of course. It's the planet that gave us Han Solo. Follow Nola Taylor Redd on Twitter @NolaTRedd. Follow us @Spacedotcom, Facebook and Google+. Original article on Space.com.